1 of 5 Heat broiler. Coat broiler-pan rack with nonstick cooking spray. Soak twenty 6-inch bamboo skewers in warm water for 20 minutes. Combine maple syrup and barbecue sauce. Set aside. 2 of 5 Cut bacon in half crosswise. In batches, cook bacon in skillet over medium heat about 3 minutes per side lightly cooked but still flexible. Transfer to paper-towel lined-plate; let stand until cool enough to handle. Cut onion into wedges; separate pieces. Place 20 pieces on a plate; microwave on HIGH for 30 seconds. 3 of 5 Cut chicken into 20 pieces, about 1 inch each. Wrap cooked bacon piece around chicken. 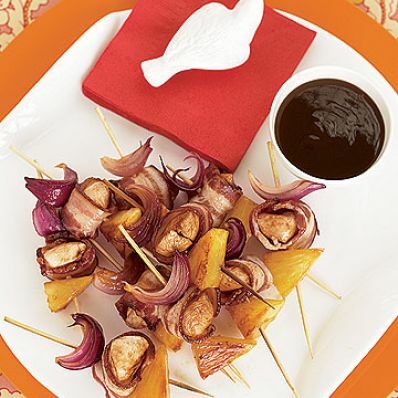 Thread 1 slice onion onto skewer, then bacon-wrapped chicken, then pineapple chunk. Repeat, filling all skewers. Divide maple-bbq sauce in half. Brush skewers with half the sauce. 4 of 5 Broil skewers 4 inches from heat for 4 minutes; remove from oven and turn over. Brush with remaining sauce. Broil 4 more minutes. Serve warm. 5 of 5 Note: For ease of preparation, buy peeled pineapple slices in the produce section and cut into 1-inch chunks. Skewers can be cooked several hours in advance; cover in plastic wrap and refrigerate. To serve, heat in microwave until warmed. Per Serving: 151 mg sodium, 17 mg chol., 0 g fiber, 0 g sat. fat, 8 g carb., 1 g Fat, total, 68 kcal cal., 7 g pro.